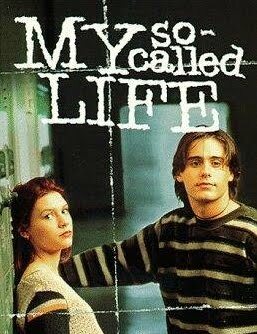 I really don't know why I'm re-watching My So Called Life. It's so good, and Jared Leto is beautiful, but it's giving me all these embarrassing, inconvenient thoughts and feelings. I'm feeling embarrassed for Angela, I'm feeling irritated at her parents, and I'm wondering why nobody loves me, even though I know that a sufficient number of people do. Basically, I'm remembering what it's like to be a teenager. Part of it is the music and fashion, as the show was first broadcast a year after I graduated from high school, but it's mostly how painfully realistic it is. Okay, so all the 'like this' and 'like that' gets annoying. 'Like like like...you're so, like, self centred or something.' I'm sure that's an actual quote. And it's very inconvenient to remember what a dork I was in high school in such a vivid, sense memory sort of way. But the reality is, everyone was a dork in high school. Teenagers are just dorks. Sorry kids. It's true. I just wish I'd known enough then to embrace the dorkishness of me, because now I realise that it really is my best feature. Now I'm going to go, like, sit in a dark room and, like, listen to Nevermind or something.